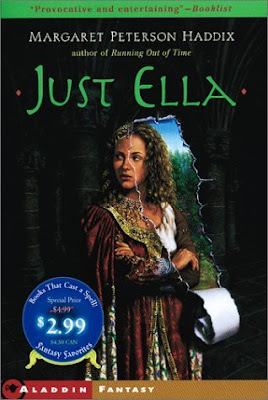 I was so enchanted by Ella Enchanted and was in the mood for more fairy tales, so I read Just Ella by Margaret Peterson Haddix. It is also based on the fairy tale of Cinderalla, but it's a different author and a different character, both named Ella. It is a fun take on Cinderella and takes place right after the Prince has asked Ella to marry him. She is now living in the castle, learning the ways of royalty, and bored to death. She has servants taking care of her every need, so unlike her previous life where she played the part of the servant. She has a mass of tutors who instruct her about things she has no interest in. And, the Prince? She realizes he is a bore and she's not in love with him after all. There is no one to turn to, but two friends. A young servant and one of her tutors, Jed. As the wedding approaches, she realizes she can't go through with it after all. I found this book enjoyable, but did not like it as much as Ella Enchanted. I thought the characters were a little flat. I think the character of Jed could have been explored more. He becomes her love interest, but I didn't see any sparks. I did like Ella's down-to-earth, independent personality. Although not as good as Ella Enchanted, I still recommend it.